Clicking on any of these modules will open a control panel where you can set the status, position, title, access level (Guest, Public, Registered or Special), the location of the module on your website and more. 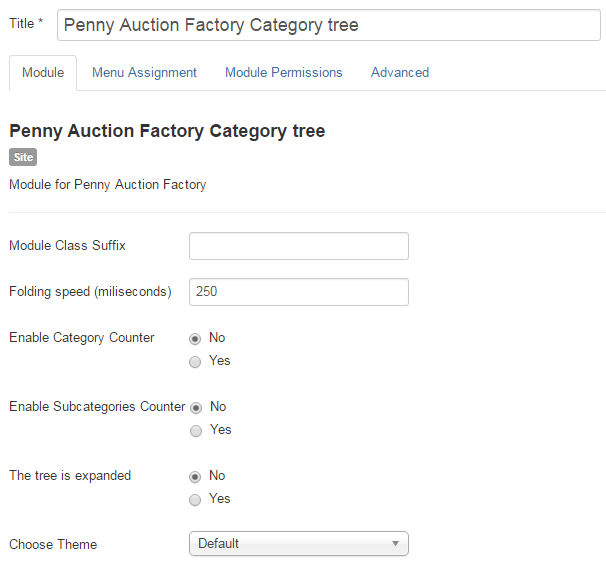 This module lists all available auctions, regardless of the category. 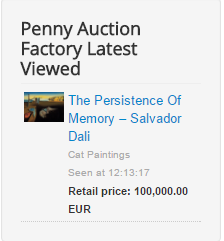 Clicking on an auction will display the details, such as it's name, current bid and retail price, alongside with the main picture. Show only featured allows you to filter the auctions shown to display only the ones that are featured, or no filter at all. Show auctions only for userid let's you set the visibility for auctions only for certain users. 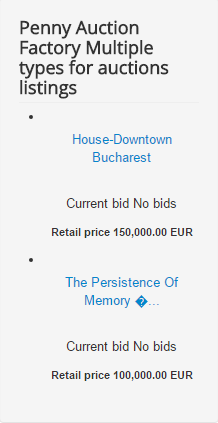 You can sort the auctions after 3 different criteria: Start Date, Title, Retail Price. 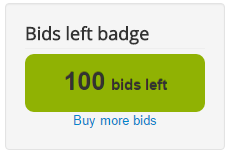 Displays the number of bids you have left. If you run out of bids , you can also buy some more within this module. 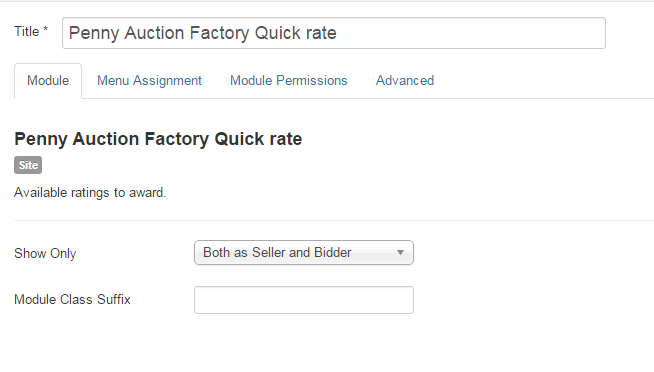 Clicking on Buy more bids will redirect you to the available Bids Packages, which we will cover in the Payment Plugins section. 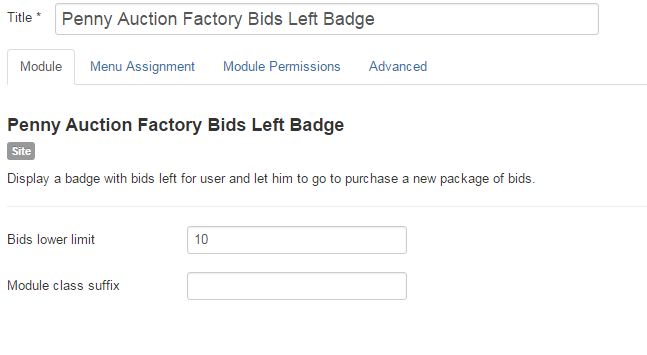 From the backend, in the Bids lower limit field, the module will display a badge when a user has a less or equal number of bids than the set value. Displays the number of payments you added to your cart. 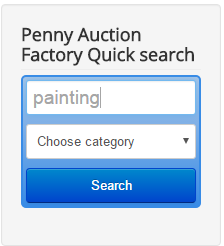 This can contain payments for bids, featured auctions, etc. If you click on the number of items in the cart, you will see details about the content of your cart. 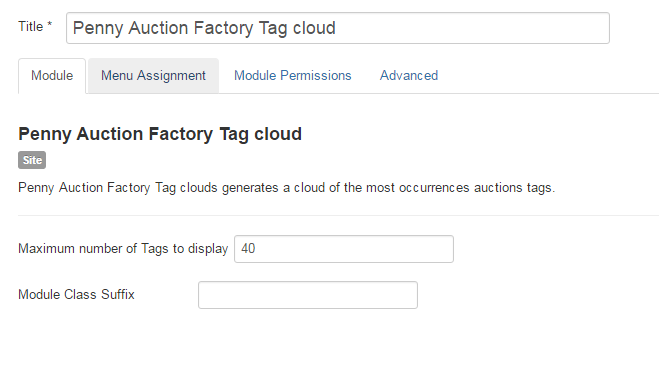 This module displays the most frequent tags used in auctions, so if you click on one of the tags, it will display a list of auctions using the selected tag. There is a minimum of 4 required tags, else they wont be displayed. Attention also to separate the tags with commas, otherwise your tags will be read as one. 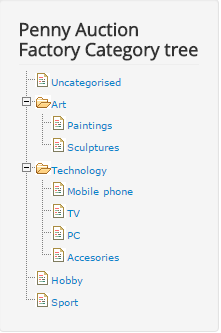 This module will display an expandable category tree on your website, which will help users find auctions from a specific category more easily. 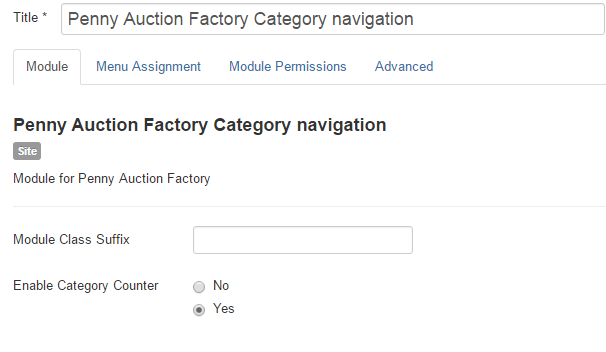 Clicking on a category or subcategory will set a filter only within the auctions of that selected category/subcategory. The "+" and "-" icons will help you expand/collapse the tree. From backend you can modify the modules' behavior by setting up the Folding speed of it when expanding and collapsing the tree. Enabling The tree is expanded will make the tree expanded by default. However, users will be able to collapse it, if needed. 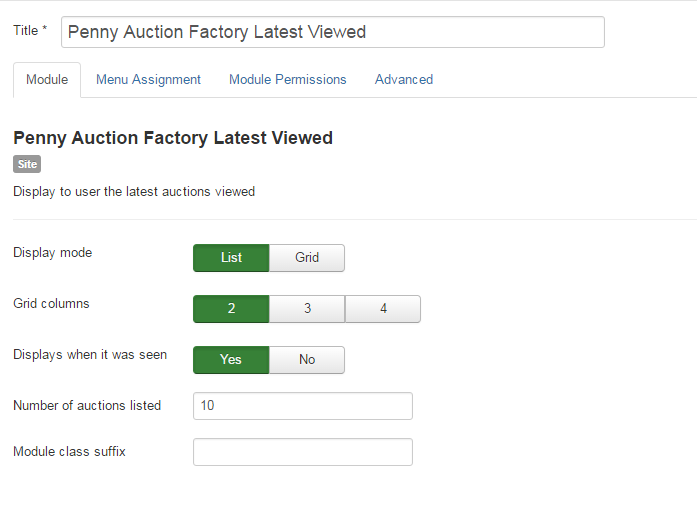 This module displays the last viewed auctions, but does not take under consideration your own auctions. Hovering with the cursor over Home will display all main available categories, clicking on one of them will display it's subcategories. On backend you can enable Category Counter, which will add the amount of active auctions next to each category. 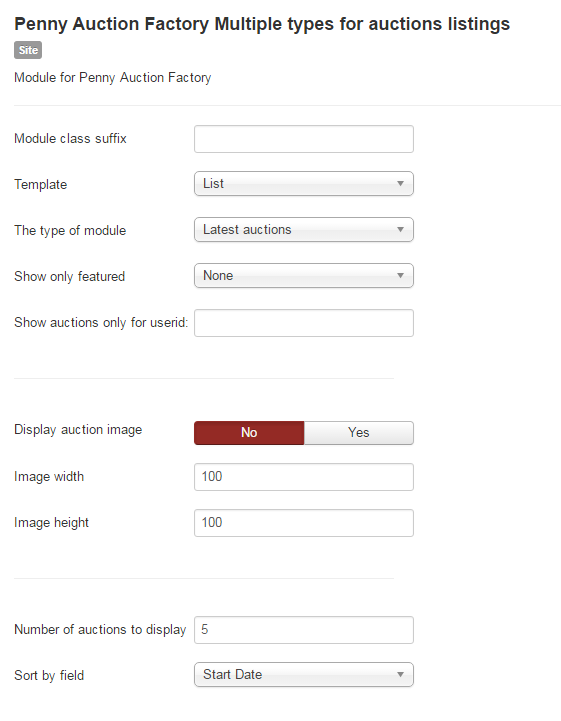 This module reminds you to rate an auction, once you win it. It's good for feedback, by helping the user have more ratings which will help in following sales. 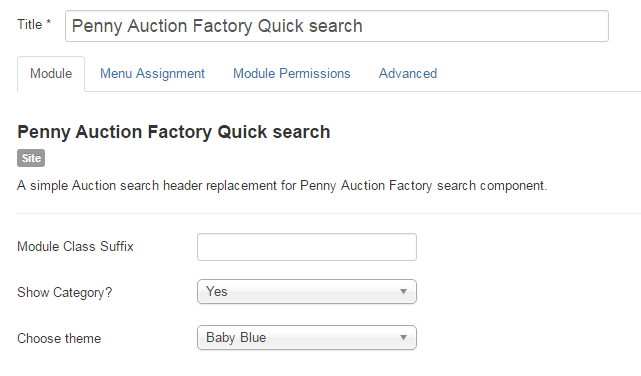 Quick Search module offers users a faster way to search for certain auctions, rather then accessing the Search page. One or more keywords can be added and a select category dropdown is also available.